These are good times for chemical manufacturing in the United States. But an active market creates special challenges for companies that need to transport chemical products. The U.S. chemical industry is going strong, according to American Chemistry Council (ACC) figures released in late 2017. U.S. chemical production volume for 2017, excluding pharmaceuticals, would be 0.8 percent higher than in 2016, finds the ACC's annual industry study. ACC predicts further growth of 3.7 percent in 2018, 3.9 percent in 2019, and 3 percent in 2020. Continued access to inexpensive shale gas, used for feedstock in the manufacturing process and for energy, gives U.S. chemical manufacturers an advantage over competitors in other locations, says the ACC. Companies have announced nearly 320 new chemical production projects in the United States, with a total value of more than $185 billion, the organization says. Foreign investment accounts for 62 percent of that value. The ACC also notes an increase in exports from the United States, creating a $32-billion trade surplus for chemicals, excluding pharmaceuticals, in 2017. Chemical exports totaled $127 billion, and imports rose by 2.8 percent over 2017, reaching $96 billion. While some regulations make life harder for chemical companies, several recent moves by the federal government could give the industry a boost, according to Adam Kroupa, general manager of the ChemSolutions business at third-party logistics provider (3PL) C.H. Robinson in Eden Prairie, Minn. One helpful development is the Ozone Standards Implementation Act of 2017, which modifies the National Ambient Air Quality (NAAQS) standards in the Clean Air Act. Under the new law, a chemical plant now needs to undergo an environmental review every ten years, rather than every five. “So producers can spend more time on development, as opposed to trying to stay current with regulations,” Kroupa says. A recent executive order from the White House established a cooperative relationship among several agencies to speed up environmental reviews for infrastructure projects. “If one department reviews a project and says that it is passed and cleared, other agencies are more quick to agree to that, so there’s not as much red tape,” Kroupa says. A third change could come if Congress passes a bill to temporarily eliminate tariffs on nearly 1,700 imported products that are not available in the U.S. “It will allow our customers to buy materials more cheaply, which then allows them to produce at a reduced cost,” Kroupa says. Although chemicals often move in bulk containers, they may also move in barrels, totes, or custom-made packaging. The size and shape of these packages can make a significant difference in transportation and storage costs. "Sometimes the packages are light, but tall, and cannot be stacked," says Chuck Breinholt, president of 3PL Rinchem in Albuquerque. "And sometimees the configuration is too wide, so they cannot be placed side by side on a truck," he adds. "Or once they make it to a warehouse, their unique size doesn't fit the racking configuration." Container sizes and packaging configurations can lead to ineffective space utilization, and wasted space costs money. So when companies source or design packaging for chemicals, they need to think about how the packaging will cube in transit, as well as in storage and at the ultimate destination. "That can help them drive out unexpected and potentially significant costs," Breinholt says. Identifying a hazardous material is the shipper's first step, and frequently the most difficult. Of all the shippers' responsibilities, the requirement to properly classify a hazardous material is critical. The other requirements are based on the proper identification of the hazardous materials. Determine whether a material meets the definition of a "hazardous material"
When moving hazardous materials, many carrier and shipper responsibilities frequently overlap. When a trucker performs a shipper function, the carrier is responsible for performing that function in accordance with 49 CFR. The cargo space of the vehicle should be suitable for the material being shipped. The vehicle itself must be in sound mechanical condition. The carrier must check to ensure that the material offered by the shipper is properly described and packaged. In addition to the provisions of 49 CFR Parts 100-180, interstate motor carriers of placarded loads must comply with the hazardous materials requirements in 49 CFR P.
These chemical logistics partners offer supply chain solutions that help shippers move chemicals and hazardous materials safely, quickly, cost effectively, and as efficiently as possible. 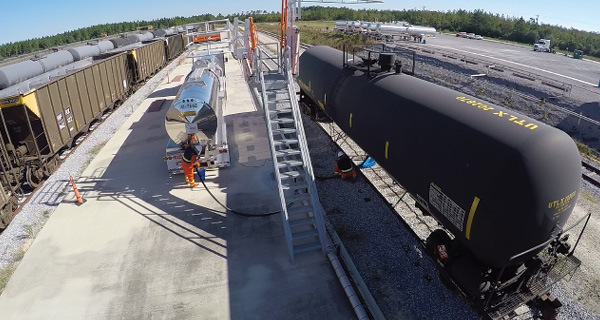 The company's ChemSolutions team connects shippers with reliable, safe, and compliant carriers. ChemSolutions experts help shippers establish and refine stringent carrier scorecard requirements and pair them with trained drivers to ensure the safety of chemicals and dangerous materials during transit. Its ChemLogix division provides chemical logistics expertise—from regulatory compliance to safety and security considerations—for smooth outcomes, risk reduction, and cost savings. The ChemLogix team and solutions focus solely on chemicals, helping companies find ways to streamline and optimize their logistics networks. Dupré provides transportation and site logistics, ranging from truck transportation to yard management, for chemical producers. Its team of industrial engineers maps the process for chemical shippers to ensure peak efficiency, with a focus on safety. Kenan Advantage Group offers a network of integrated hauling solutions to meet custom needs. Its chemical transport solution applies strict safety and security measures to provide chemical shippers with reliable hauling service and guaranteed capacity. Landstar agents understand the complexity of the chemical supply chain. The company constantly monitors shipment temperatures throughout the transportation lifecycle to maintain product stability and integrity. Landstar's transportation services utilize a range of specialized equipment. MILS offers metered tank trucks to help chemical shippers use capacity more efficiently. This lets shippers provide a series of multi-stop deliveries in variable amounts to their customers. In addition to transportation and logistics services, MILS provides supply chain management, order fulfillment, inventory management, a transload and warehouse facility, equipment leasing, and maintenance. Rinchem provides customized logistics solutions to manufacturers of chemicals and gases. Rinchem manages and coordinates all logistics-related activity, evaluating costs, modes of transport, customer service levels, and opportunities for consolidation. Rinchem's Chem-Star warehousing management module offers real-time inventory visibility and the use of RF technology to improve receiving and picking speed and accuracy. The port's Supply Chain Authority team works across port functions—operations and terminals, commercial and economic development, information technology—to provide a customer-centric process to meet chemical shippers' unique logistics challenges. Transplace helps chemical shippers streamline operations and realize greater visibility of the entire shipment lifecycle, optimizing and tracking shipments in real time while providing status updates to customers. Electronic tendering capabilities provide a clear view of shipment tenders.